Greetings all;…… In this edition I would like to discuss side kick and why our Founder (Master Hicks) places so much emphasis on it. 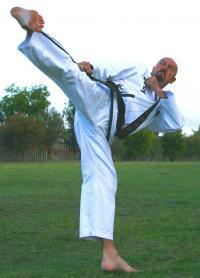 Our Founder, Master Les Hicks, has always believed that side kick is Tae Kwon Do. We at Shim Jang cultivate it as one of the foundation stones of our art because many other kicks are derived from the basic side kick, the side kick can be quite a difficult kick to learn although once mastered it can be one of the easiest to execute. The side kick may not be your favourite kick but learning and mastering this technique will definitely assist you to be a good practitioner and it will greatly enhance your ability as a martial artist. Why ?...... because the side kick requires speed, power, balance and use of the hip, with all these attributes the side kick becomes a very important technique when teaching the fundamentals of our art. When executed correctly, the side kick is fast, accurate and extremely powerful, it can be used almost any time in self defence or sparing and it is a formidable weapon that has the capability of immediately stopping an aggressor in their tracks. Generally, side kick is used to attack the solar plexus or rib cage area allowing it to be used to its maximum potential by delivering optimum power to a vulnerable target but it can also be used low section to the knee (checking kick) or high section to the head (as a jumping or flying kick). If an opponent is charging in on you the best defence is usually the side kick because it can be used as a stationary, skipping or back kick (which are all variations of the side kick). So how do you execute side kick? 1. Basic side kick is delivered from a well balanced back stance. 2. The ball of the heel is the weapon. 3. The heel travels from the floor to the target in a straight line. 4. The knee is lifted high toward the front of the body (as in front snap kick) with the foot and toes pulled back to prepare the heel (weapon) for impact. 5. The heel is then thrusted toward the intended target in a straight line without dropping the knee or bringing the knee to the side of the body activating the hip. 6. When the kick is finished, the leg should be locked straight with the whole body including the hip in a straight line behind the kick, the supporting foot is usually facing in the opposite direction and the head should be facing the heel. NOTE; Constant work on this kick will stand you in good stead for future success within the art so Practice, Practice, Practice ! In closing I would like to wish all members and their families a happy and safe Christmas and New Year break. I look forward to seeing you all fit and well in 2015.